A collection of beautifully designed pubs that serve a cosmopolitan range of ales and beers with a wonderful food menu featuring the famous “hanging kebabs”. 1. Install sound systems that can handle live music or DJs seven days a week. 2. Provide pianos that match the décor but can be played every day. 3. Curate background music collections that have wide customer appeal. 4. Recruit, book and manage a nationwide team of top class musicians and DJs. Working with our three partner audio companies and the NWTC designers we install audio systems that provide quality audio coverage as well as being sympathetic to the amazing interior designs. The systems are consistent from venue to venue to ensure the managers benefit from system familiarity. Our friends at Vale Pianos provide carefully restored upright pianos that each contain a Kawai digital piano. These pianos look fantastic, play well and sound great without the expense and inconvenience of regular tunings. For the Florist we have worked with the audio companies and design teams to deliver a bespoke DJ set up that can accommodate sax and percussion players alongside the DJ. The Botanist background music collection is “All Killer – No Filler” with 2500 songs from the fifties to the present day. It is updated every month with new music from classic artists and emerging talent. The Florist music collection is very different from the Botanist with a focus on the contemporary sounds of Soulful Electronica, Nu Disco and Deep House. We have an amazing team of around 400 musicians and DJs actively working with us and NWTC. The musician line-ups include piano vocalists, guitar vocalists, duos, trios and 4-piece bands. 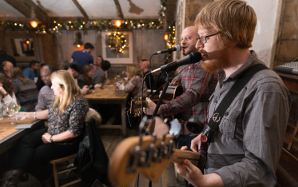 In addition to the regular residency gigs we also organise musicians for “Sing-a-Longs”, Pub Quizzes, Christmas Carols themed nights and special events. 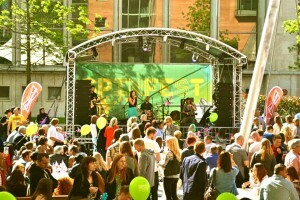 At the Oast House in Spinningfields we programme and stage-manage “Spinfest” on each Bank Holiday Sunday. Starting in 2012 this event has grown to a popular “must visit” in Manchester. A brilliant opportunity for our resident musicians and their bands to play in front of a crowd of around 1,000. Following on from the success of “Spinfest” we programme one day festivals at the Clubhouse (Liverpool), Canal House (Birmingham) and the Botanist (Reading).